[Newsmaker] What’s next for Lee Jae-yong? Samsung heir apparent Lee Jae-yong’s life has been turned upside down since he was taken into custody on allegations of bribery Friday. For the second consecutive day on Sunday, Lee stood handcuffed and bound with white ropes in front of special prosecutors, his prisoner identification number marked on his navy suit. He is the first head of Samsung to be locked behind bars in the conglomerate’s history. At the Seoul Detention Center in Uiwang, Gyeonggi Province just outside Seoul, he is being kept in solitary detention in a 6.56-square-meter cell, subject to the same rules as other inmates that include Choi Soon-sil, President’s Park Geun-hye’s confidante. Choi is the center of the scandal involving the president, as she reportedly pulled strings to collect questionable funds from the country’s economic behemoths, including Samsung. Also detained in the same facility are former presidential chief of staff Kim Ki-choon and former Culture Minister Cho Yoon-sun. The solitary rooms in Korea have heated floors, a foldable mattress, a TV and a toilet. Three times a day, Lee receives meals on a tray through a window in the door of his cell. After each 1,400-won ($1.20) meal of rice, soup and three side dishes, Lee must wash his own tray and return it through the same window. This will be Lee’s routine, at least until he is officially charged by prosecutors, at which point he will be eligible to be released on bail. Special prosecutor spokesman Lee Kyu-chul said the Samsung leader will be charged before Feb. 28, the deadline for the special prosecutors’ investigation. Under the current law, the special prosecution has 10 days to indict Lee, unless it is granted an extension. Courts may grant a 10-day extension of this deadline. However, if Lee is not indicted by the special prosecution before the investigation deadline of Feb. 28, his case will be handed over to regular prosecutors. Reports say that the special prosecution intends to bring five charges against Lee including perjury and hiding assets overseas, but the main charge will be that Lee bribed Choi in exchange for backing a merger of two Samsung affiliates in 2015. Although the law regarding special prosecutors normally allows courts six months following an indictment to issue a ruling, the regulations have been changed for the corruption scandal surrounding President Park. Under the changed rules, the first court ruling on Lee’s case must come within three months of his indictment. If the case is appealed, courts will have two months for an appeal ruling and an additional two months for a third and final ruling, meaning that Lee’s case may take up to seven months to reach a final verdict. This means that the final ruling is expected to come sometime in September. According to news reports, Samsung currently has no plans to contest Lee’s detention and is carefully weighing the possibility of posting bail. Top Samsung officials have been meeting with Lee through visitations. On the first day of Lee’s detention, he was visited by Vice Chairman Choi Ji-sung of Samsung’s Future Strategy Office, and by Samsung Electronics’ head of communications Lee In-yong the next day. A Samsung official has been quoted in reports as saying that the arrest warrant itself would probably not have been approved if there were a possibility to revoke it through contestation. 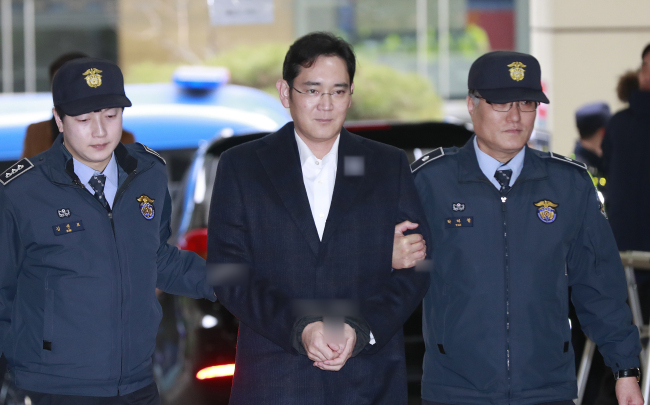 Other conglomerate heads who were also detained at the Seoul Detention Center for their own separate charges in the past include Daewoo Group founder Kim Woo-choong, Hanhwa Group Chairman Kim Seung-youn and CJ Group Chairman Lee Jae-hyun.